Ivy Wangechi’s brutal death has left the nation in shock. Wangechi, a student at Moi Univesity School of Medicine was hacked to death on Tuesday morning by Naftali Kinuthia, a man said to be well known to her family. Ivy was killed on the eve of her birthday. She was to turn 25 years old on April 10, but she never lived to see this day. 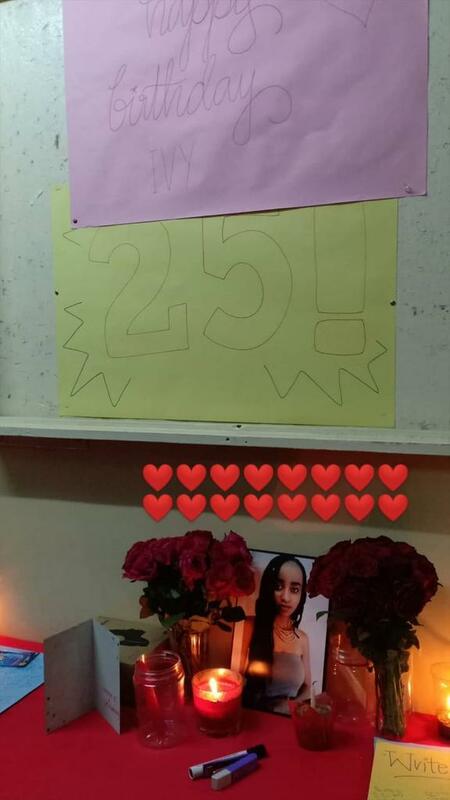 Yesterday, her friends and classmates at the Moi University in Eldoret celebrated her birthday in the most sorrowful way. She wasn’t there to eat cake and blow candles and make a wish. Muriithi Michael shared the image below on Twitter. #RIPIVY Happy birthday dear. Shine on angel. Happy birthday IVY Wangeci. Happy 25th birthday Ivy Wangeci… Rest easy. #RIPIVY #HAPPYBIRTHDAYIVY This is at the entrance of our hostel, in Moi University School of Medicine Main Hostel. Deelaboso My heart aches for #IvyWangechi We’ve lost a beautiful, intelligent, hardworking lady None of the allegations surrounding her demise are true! It’s unfortunate that all those boldly peddling these rumors never once interacted with her.